In this series I have captured certain moments of performance experienced in everyday situations, and am looking at the experience of performing and behaving according to expectations, what it means to perform, the point at which something becomes a performance, and when it begins and ends. As a result I have attempted to look at these ideas within the notion of thresholds. The first series, Gap, literally recreates different thresholds, both private and public, and elevates the transition between the two spheres. The second series, Elevated Performance, examines the theatricality and anxiety of these public performances through the framing of a specific social scenario or venue, the elevator. 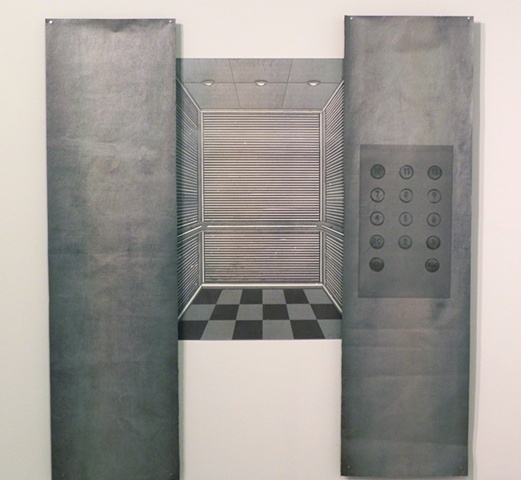 This work looks at the ways in which different social situations are initially approached and are then actively performed through the consolidation of time and space within the elevator. The final triptych, initially titled Public Scenario, examines the thresholds of perception in terms of performance. In these pieces, the level at which these scenarios become a performance are highlighted as the ratio of private to public are consolidated and expanded.